A weaving promenade connecting Dover’s famous white cliffs has scooped the Ã‚Â£10,000 first prize in the Dover design contest. Describing it as ‘an iconic urban sculpture’, the London-based winners Steven Kingsley and Miki Zinaberg collected their Kent County Council cash prize at the Dover Pride award ceremony last Thursday. Ideas from the best of the 70 entries will now be used to work up a bid to the National Lottery in January. If successful, the bid would then be given £250,000 and a year to develop a scheme with the local community to compete in the People’s Millions telethon. The second place prize of £3,000 in the public vote went to designers craft:pegg for Dover Lines, a project to re-create the town wall. 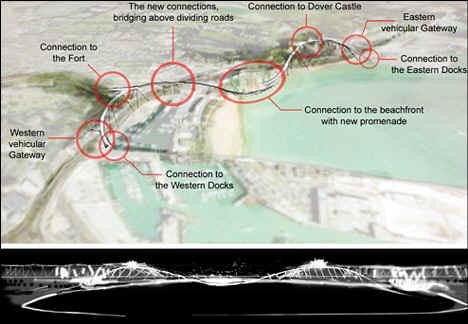 Third prize of £2,000 was won by architects Blackwell Friend for three projects – the White Cliffs walkway and vertical link and the Dover Arc, a bridge link between the docks which removes lorries from the waterfront.